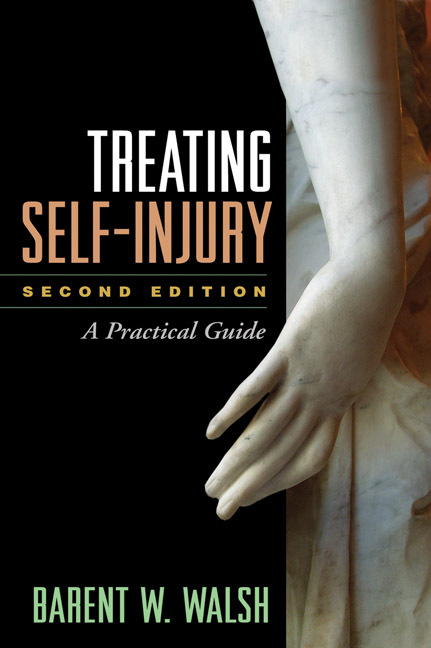 This trusted practitioner resource is acclaimed for its clear, compassionate, and hopeful approach to working with clients who self-injure. Barent Walsh provides current, evidence-based knowledge about the variety and causes of self-injurious behavior, its relationship to suicidality, and how to assess and treat it effectively. Illustrated with detailed case examples, chapters review a wide range of cognitive-behavioral interventions. Essential guidance is provided on tailoring the intensity of intervention to each client's unique needs. Walsh is joined by several colleagues who have contributed chapters in their respective areas of expertise. Reproducible assessment tools and handouts can be downloaded and printed in a convenient 8½" x 11" size. Incorporates up-to-date research and clinical advances. Now uses a stepped-care framework to match interventions to client needs. Chapters on the relationship between suicide and self-injury, formal assessment, family therapy, and residential treatment for adolescents. Special-topic chapters on the "choking game," foreign body ingestion, multiple self-harm behaviors, and self-injury in correctional settings.